Irish Network Colorado (INCO) and the Celtic Connection are hosting a meet and greet reception in honor of our new Irish consul general on Wednesday, May 20 from 6 to 8 p.m. at Katie Mullen’s Irish Restaurant at 1550 Court Place in Denver. 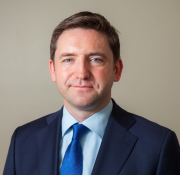 Consul General Adrian Farrell was appointed to the Consulate General of Ireland, Austin, Texas in September 2014. He is eager to meet the Irish-American community and those with an interest in Ireland and will make brief remarks at the event. 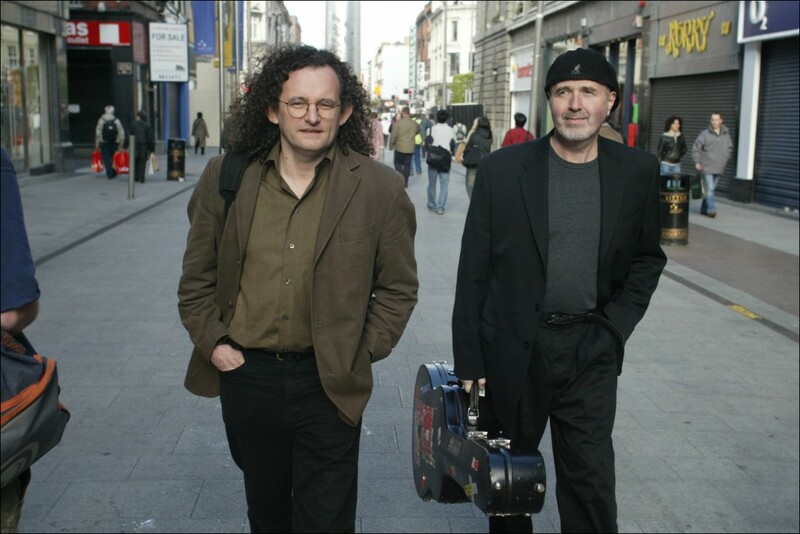 Irish Network-Colorado is in cahoots with Celtic Events to offer an evening out with critically acclaimed fiddler Martin Hayes and master guitarist Dennis Cahill at the Soiled Dove! You may purchase tickets for the concert at www.soileddove.com or by calling 303.226.1555. The show starts at 8 p.m. (doors open 7 p.m.) downstairs at the Soiled Dove. When you purchase tickets, you’ll be assigned specific seats, so there’s no need to queue early at the venue. ADDITIONALLY, if you’d like to come ahead of time to have dinner together with Irish Network friends at the restaurant upstairs, please RSVP HERE BY MAY 8 FOR DINNER RESERVATIONS AT 6:30 ON THE 15th. We’ll hold a spot for you in our group. Separate checks, of course. Please feel free to come to either the concert or dinner if you can’t make both. 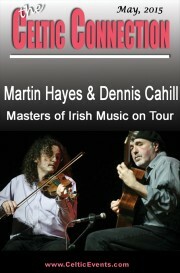 Martin Hayes and Dennis Cahill are two of the world’s leading innovators in traditional Irish music. Their deep interpretations are recognized the world over for their exquisite musicality and irresistible rhythm. The New York Times calls them “a Celtic complement to Steve Reich’s Quartets and Miles Davis’s ‘Sketches of Spain.’” The duo make a rare visit to Colorado this May, performing Friday the 15th at the Soiled Dove Underground and on Saturday the 16th at the Stargazers Theatre in Colorado Springs. Fiddle player Martin Hayes was born and raised in rural County Clare, the son of esteemed fiddler PJ Hayes, and is acknowledged as one of Ireland’s most innovative and influential artists. A former member of his father’s renowned Tulla Ceili Band, Martin had won six All-Ireland Fiddle Championships by age 19. He has performed with Sting, Paul Simon, and Sinead O’Connor; and taught Jeremy Irons to play a fiddle tune. His many awards include Folk Instrumentalist of the Year (BBC), Spirit of Ireland Honoree (Irish Arts Center), Man of the Year (American Irish Historical Society), and Musician of the Year (TG4 Gradam Ceol, Ireland). Dennis Cahill is a master guitarist, a native of Chicago born to parents from County Kerry, Ireland. His background includes study in classical, jazz, blues, and folk. Dennis’s spare, essential accompaniment to Hayes’ fiddle is acknowledged as a major breakthrough for guitar in the Irish tradition. The duo have three acclaimed albums together on Compass/Green Linnet Records; the latest is Welcome Here Again. Martin and Dennis are also making waves with their award winning new band The Gloaming, who just took Ireland’s top award the Meteor Choice Award for the best album of 2014. The self-titled CD, called “astonishingly beautiful” by NPR, rocketed to the top of Irish charts and landed on many best of year lists for 2014 including NPR, The Guardian, and The Irish Times. Martin and Dennis are also making waves with their acclaimed new band The Gloaming, who just took Ireland’s top award the Meteor Choice Award for the best album of 2014. The self-titled CD, called “astonishingly beautiful” by NPR, rocketed to the top of Irish charts and landed on many best of year lists for 2014 including NPR, The Guardian, and The Irish Times. Sat. May 16: WORKSHOPS, fiddle & guitar: 1355 Lindenwood Grove, Colorado Springs. To register in advance contact David Clark (dbclark50@yahoo.com, cell 719 310 4180). On-site registration will start at 12:30 PM and will end promptly at 1 PM. 1pm-3pm. $50 per person. Space is limited. Sun. May 17: WORKSHOPS, fiddle & guitar. Eron Johnson Antiques, 389 South Lipan Street, Denver, CO 80223, 1-3PM, $50 per person. Space is limited. Reserve your place by emailing adamtagee@gmail.com. An influential figure in the history of Irish rock, an award-winning off-Broadway musical, the Arvada Center and Colorado’s multi-talented band Colcannon intersect in a Celtic-harmonic convergence with the Regional Premiere of the play A Man of No Importance this month. Horslips was one of the first Irish bands to combine traditional songs with a rock beat. The band was together from 1970 until 1980. In 1994 Barry Devlin, an original member of the band, its vocalist and front man, was writing for television (including some scripts for Ballykissangel), producing music videos (some early U2 clips) and doing screenplays, including the one for the film upon which the musical is based. Starring Albert Finney, it briefly appeared and vanished almost without a trace, doing less than $1 million at the American box office. In the fall of 2002, the musical based on the film debuted off-Broadway in the Newhouse Theater at Lincoln Center in New York City. Developed by the creative team that won Tony Awards for Ragtime, the production won the Outer Critics Circle award for the best off-Broadway musical of 2003. Rod A. Lansberry, Arvada Center Artistic Producer saw the play at the Lincoln Center in 2002 and fulfills a long-held dream of presenting and directing the show for Denver audiences with this production. On a trip to Europe last year, he spent four days in Dublin where he explored the city, visited pubs and spent time with a man named Liam in the Dublin Transportation Museum gathering background information, inspiration and details for the set and costumes. The play tells the story of Alfie Byrne, a gay and closeted bus driver who lives in a working-class neighborhood of Dublin. An Oscar Wilde devotee, he has ambitions to perform Wilde’s Salome with his amateur theater troupe in the local church hall; however, Alfie doesn’t realize the controversy his choice of title will create with the church leaders. With the play opening in jeopardy, Alfie turns to someone he thought was a friend, only to be confronted by anger and rejection. The theater troupe stands beside him and helps Alfie find his place in the world. Set in an Irish pub called Scruffy Murphy’s (Denver’s LoDo pub of the same name has provided support for the play), the action and music take place in a setting familiar to those with their own local or who have visited one in Ireland. Folk Ragout and special guest Katie Henderson will perform Irish tunes, French songs, and Old-Time fiddle, Thursday May 14th, 7:30PM at Swallow Hill , 303-777-1003. Angus Mohr reached Number 1 for Denver Rock Bands on ReverbNations March charts. Adam Agee and Jon Sousa play at The Book Haven in Salida at 7 PM on the 1st. The Five Spice World Music Ensemble (Beth Gadbaw, Sandra Wong, Steve Mullins and more) play Irish, English, Greek and Spanish songs (with some Flamenco dancing thrown in) for the Concert Series at Congregation Nevei Kodesh in Boulder on the 2nd at 7:30 PM. On the 16th, Beth Gadbaw and Margot Krimmel play in the Schlessman Hall of the Denver Public Library Central Branch, 10 W. 14th Ave. from 2-3 PM. Margot Krimmel contributes harp playing to the Murmuration multi-faceted arts extravaganza at the Buell Theater in the Denver Performing Arts Complex on the 30th. Potcheen plays at the White Water Bar in Canon City on the 1st; Jack Quinn’s Irish Pub in Colorado Springs on the 2nd and is part of the program for “Kilted on the River” at The Riverside in Boulder on the 16th. The show runs form 1 PM – 9 PM. Celtic Legacy brings their high energy tribal drum sound to the Kilted on the River show on the 16th. And just for a bit of variety, The Stubby Shillelaghs are also at the Kilted on the River bill on the 16th. Avourneen plays at 8:30 PM at Katie Mullen’s in downtown Denver on the 1st, 8th, 15th, 22nd and 29th, at the Beer Depot Lounge in West Denver from 4-8 PM and at the Abbey Tavern on dates and times TBD. Adam Goldberg is at Lannie’s Clocktower Cabaret every Saturday night if you want some late night Irish tunes. 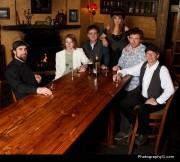 As usual, the Mountain Road Ceili Band is at The Margarita at Pine Creek in Colorado Springs the 15th from 6:30-9:30 PM. Colcannon provides the music for the play “A Man of No Importance” at the Arvada Center. Performances run until May 17 with Talk Backs after the May 8 evening show, and May 13th after the matinee. Performances are on Fridays and Saturdays at, 7:30 PM and Saturdays and Sundays at 2 PM. Center seats are $73, prime, $67 and value $59. Shows on Tuesday, Wednesday and Thursday at 7:30 PM and the 1:00 PM Wednesday matinee, tickets are $66 for center seats, $60 for prime and $53 for value. The Indulgers are on the road for shows in Kansas at Th’ Gatherin’ celebration of Beltane in WaKeeny on the 1st and 2nd and at the legendary Dubliner Pub in Omaha on the 15th and 16th. On the 8th, they are at Expresso Vino in Lafayette for FAC at 5:30 PM, at the Eagles Lodge in Denver on the 22nd at 7 PM and close out the month at Conor O’Neill’s in Boulder on the 29th at 10 PM. Brian Clancy is Jack Quinn’s in downtown Colorado Springs at 7:30 PM on the 7th, 14th, 21st and 28th and at the Irish Snug on Capitol Hill in Denver at 8:30 PM on the 2nd, 9th, 16th and 23rd. Ceol Ceili plays with the Woodland Park Wind Symphony on the 3rd and has upcoming shows at McGinty’s Wood Oven Pub in Divide. 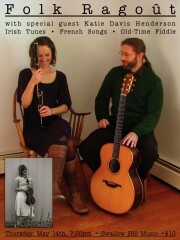 They will also be guests on the KRCC Celtic Show on the 17th at 7 PM. Folk Ragoût and special guest fiddler Katie Henderson will perform Irish tunes, French songs, and Old-Time fiddle, Thursday May 14th,2015 7:30PM at Swallow Hill, Denver CO , 303-777-1003. On Saturday, May 30th, 7:30pm Folk Ragoût will be in concert with Lights Along the Shore at Snowy Range Evangelical Free Church 2552 North 15th Street, Laramie, WY. Frédéric and Leslie met at the Irish World Academy in Limerick, Ireland and began performing together in Northern Europe and America. Folk Ragoût explores extended technique, highly textured arrangements, and percussive illusions to create a distinctive style within the tradition of the flute and guitar duo. Their music is inspired by an Irish traditional touch and focuses particularly on their French Breton and French Canadian heritage. The French-American pair has been enjoying critical acclaim since the release of their 2011 self-titled album. While performing in Scotland with New Time Ensemble, their arrangement of “Da Bride’s a Boannie Ting” was selected for the Edinburgh Folk Club’s Best of 2011 Album. Folk Ragoût was chosen as a selected performer for the Southwest Regional Folk Alliance Conference in 2012, and in the same year they recorded for Liz Davis Maxfield’s The Irish Cello Book, which was published by Hal Leonard. Folk Ragoût also performs and tours with New Time Ensemble. With their great love for the traditional Celtic music of France and French Canada, Folk Ragoût’s performances are unique, beautiful, and virtuosic. Immersion Camps: The first immersion camps in Irish language and culture were organized in the Gaeltachtaí (Irish-speaking districts) of Ireland in 1901 and quickly became a corner-stone of the movement to preserve Ireland’s ancient Gaelic culture. It was here that students encountered the living culture, learned the language, the music and dance and returned home to share their learning and experience within their own communities. The importance of these camps in saving the culture from extinction is undeniable. The course offered in Butte again this summer is designed to give students the same experience, with the hope that they in turn will help in the movement here in the United States to preserve and promote their ancestral heritage. Location: The course will be offered at Montana Tech, in Butte. Butte was the entry-point for the majority of the Irish in the state. It was a town built by the Irish, for the Irish and has a distinct Irish flavor to it. 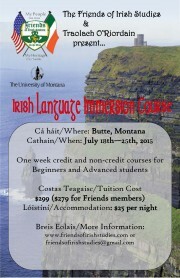 The immersion course is held at Montana Tech. You can get directions by logging on to www.mtech.edu. For those of you flying in arrangements can be made to pick you up from the airport in Butte by contacting me at toriordain@hotmail.com with your name, flight number and time of arrival. Curriculum: The course offers both credit [two credits] and non-credit courses and is open to all who wish to learn the Irish language. The accredited courses are for beginners only. The main objective is to impart a conversational knowledge of the Irish language. Classes begin at 9:00am and continue until 4:30pm in the afternoon. There are lengthy breaks between classes so students can work together and study the material covered in each class. The evening time is reserved for the student to study or engage in recreational activities with their colleagues. There is a lot going on in Butte and many enjoy evening walks, investigating the old city, and visiting some of the many sites commemorating the history of the Irish in the town. Believe you me, you will not be bored! Accommodation: For those coming from out-of-state there is room Butte on the Montana Technical College campus. To view the facilities, please go to www.mtech.edu. For those of you not wishing to forsake the creature comforts for the dorm experience, then there’s the Hodgens Ryan Mansion. I would suggest booking early here, as it is just off campus, very comfortable and very reasonable.